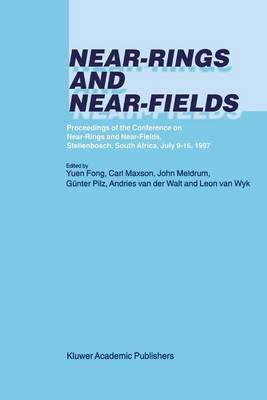 This volume contains three invited lectures and sixteen other papers which were pre- sented at the 14th International Conference on Nearrings and Nearfields held in Stellen- bosch, South Africa, July 9-161997. It was also the first nearring conference to be held after the untimely death of James R Clay, who over the years had been an inspiration to many algebraists interested in nearring theory. The occasion was marked by the invitedtalk of Gerhard Betsch, which was devoted to an overview of Clay's contributions to nearring and nearfield theory. This book is affectionately dedicated to the memory of James R Clay. All the papers presented here have been refereed under the supervision of the Editorial Board: Fong Yuen, Carl Maxson, John Meldrum, GUnterPilz, Leon van Wyk and Andries van der Walt. Thanks are due to the referees and to the Editorial Board. A special word of thanks is due to Wen-fong Ke for preparing the final version of the TEX files, and to Fong Yuen for his pains in arranging for the publication of the volume with Kluwer Academic Publishers. Andries van der Walt Stellenbosch, August 1999 COMBINATORIAL ASPECTS OF NEARRING THEORY TO THE MEMORY OF JAMES RAY CLAY GERHARDBETSCH A briefcurriculum vitae ofJames Ray (Jim) Clay Born November5,1938 at Burley (Idaho). Died January 16, 1996 at Tucson (Arizona). Married since 1959 to Carol Cline BURGE, "a truly beautiful daughter of Zion" (Dedication ofJim's 1992 book). Three daughters, ten grand-children.